I'm seeing an error in my log about every 3 minutes... The driver is working but hate seeing any error in my logs! I'm using the RGB version. Also, could you add an option to turn on/off the Debug logging? Not sure what's going on there in the RGBW driver. I'll check it out! Thanks for the info. If you wouldn't mind ... I think I remember what I did wrong for the RGB driver. Would you test this driver? And if that one doesn't work, give this version a whirl? Thanks! Let me know if one works—I think the first one might... but I'm not entirely sure. Both turn on when changing the level but still no difference with setting the level, hue or saturation. I try to set the level to 10 but it sets it to 100 itself, probably the response of the module. The map issue is a new one. I noticed it on a different driver last week, and I've got a few ideas on how to fix it, but I'm going to have to ask Mike a few questions on how it's been implemented, first Essentially, my driver checks if the value passed through is within range, and this is where the error comes in. I think that, in this case, it may be stopping transmission for setColor and that may be where you're seeing the error. Once I get a chance to take a look later this week (my device should arrive before Wednesday), I should be able to fix it. I've been getting those map error messages too. I know you're busy, especially this time of year, was just hoping to see this project updated at some point, I'll gladly provide any info required. Keith! I was going to send you a message the other day --- got too busy. I think I know what's going on with the issue you posted. The devices I ordered are still in their boxes---I'll bring those with me and test them out over the holidays. Haha don't loose time with the fam. I keep thinking I'll do things over the holidays too. I'll probably just be lazy though. Thanks for any work put in on it. Thanks for the driver, I will be testing it tomorrow, I already installed and added the virtual rgbw controller to HE, I want to request a switch to turn on/off the debug logs. Absolutely, I wil add that. Thanks for testing it out; let me know what else you’d like to see different in it. I tested your driver, it works some of the options, just the on/off, set level and set white level, all other options related to color did not work. I'm not sure if I'm supposed to reflash the controller, any help will be appreciated. Thanks. No flashing required --- it will work out of the box. I have to fix some issues with that driver. I have a box full of devices to go through and pull some information from. Next week, I'm planning to do that. Until then, I apologize that color (and other options) aren't working. Just checking in to say thanks to @adamkempenich. 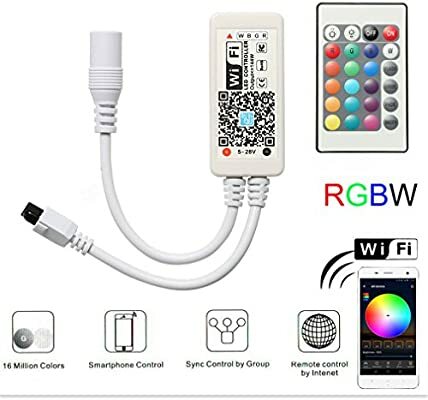 I had a four years-old set of Hitlights RGB (2×5m string) with a dumb controller that I just used a Z-Wave outlet to switch on/off. Bought a MH controller for $14.99, swapped, installed the app, installed this DH and its working great with Hubitat. Next up is to play with Rule Machine to experiment with all the color controls. And to get creative with ideas on where to deploy more. For the time being, I’m going to pull the 0.7 device drivers. I’ve learned that in some cases, it can make a hub incredibly slow. I’ll do my best to get this fixed, and I’m sincerely sorry that this may have caused your hub to slow down, and I’ll do my best to fix it for you all. Hello Adam, sorry to hear that, yes, actually I had to remove the driver to get back the speed per HE support recommendation. I'm waiting impatiently your update and thank you for your support. Please don't drop the driver, I'm available to use my developer hub to test it, not sure why I didn't test it in that hub first but everything is fine now, please let me know to test your new code. Is there an earlier version that we can revert that doesn't manifest the problem? In any case, don't let it ruin your Christmas. We can live until you get around to it.